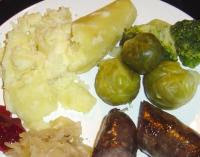 In Norway, Christmas dinner is often accompanied, amongst several things, by boiled potatoes and Brussels sprouts. The potatoes are often of a mealy sort, and peeled before cooking rather than after. Mashed potatoes are a result of the outer parts of the potato being cooked too much before the inner parts are tender. Potatoes contain pectin, the cement which holds the cells together. Pectin is soluble in hot water, and when mealy potatoes are boiled, the pectin dissolves in the water. The cement is gone, and the potato fall apart in it’s separate cells. There is, however, an enzyme in the potato that helps the pectin molecules to cross-link internally, so the pectin stays in the potato. This enzyme is active between 50 and 60 °C. The solution is: leave the potatoes in water at this temperature for 20-30 minutes before heating further up, and your potatoes will not fall apart (use a standard cooking thermometer). But beware; the cooking time will be longer. Cooking bacalhau a couple of weeks ago, I had a fascinating experience (in Norway it goes by the name bacalao. Bacalhau is a Portuguese/Brazilian fish dish, in this case a hot pot with tomatoes, potatoes, onion, clipfish, black olives and olive oil). 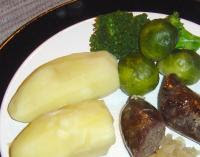 The potatoes were pre-cooked as described above, peeled and cut in large pieces, and added to the hot pot. After 75 minutes simmering, the potatoes were still not tender, and the guests had to wait another 15 minutes. One and a half hour’s simmering before the potatoes were tender! The potatoes, by the way, kept their shape perfectly even when the dish was reheated. If you deliberately want the potatoes to fall apart, i.e. to thicken soup, you should do the exact opposite: put the pre-peeled potatoes directly in boiling water. One problem with such pre-cooking is the off-colour (enzymatic browning). This can be fixed by adding a little acid, a tea spoon of vinegar or some lemon juice, or an antioxidant; a C-vitamin tablet or a tea spoon of pure ascorbic acid does the trick. The acid retards the reaction, while the ascorbic acid (C-vitamin) sacrifices itself in the reaction. A drawback is that vitamin-degrading enzymes are also efficient at temperatures between 50 and 60 °C, so focusing on texture results in lower vitamin content. For everyday dinner I’d put unpeeled potatoes directly in boiling water to deactivate the vitamin-degrading enzymes, alas deactivating the pectin reinforcing ones as well. 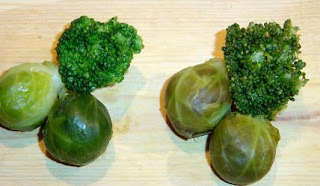 Part two will deal with the Brussel sprouts - how to achieve a fresh green colour rather than a pale olive-green colour. A Norwegian version of this post can be found at www.naturfag.no/mat.